Monika Nidhii - These Sparkly Bridal Lehengas Are Perfect For Your Sangeet Night! 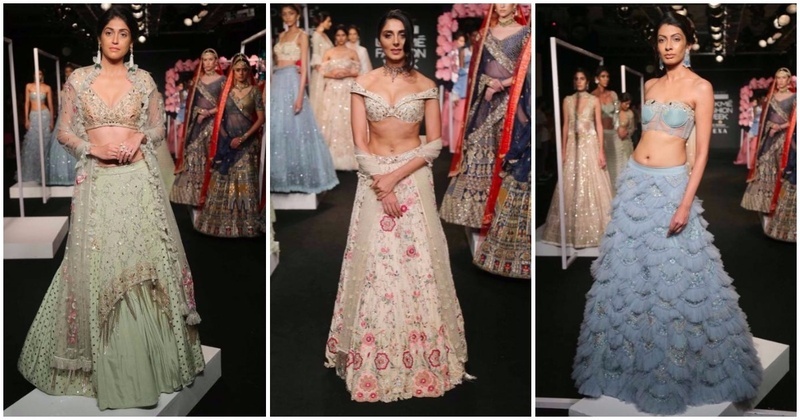 Designers Monika and Nidhii showcased their latest bridal collection at Lakme Fashion Week for the first time and it serves as major wedding inspo for every modern bride out there. Titled ‘An Ethereal Romance', the collection was every bit whimsical as one can dream it to be. Pernia Qureshi looked stunning as she walked down the ramp as showstopper in an ivory lehenga with sparkling floral embroidery and a fitted off-shoulder blouse. This feminine line was full of flowy fabrics, pastel colours and sparkling embroidery. The silhouettes took inspiration from the Victorian era with corset-blouses, ballroom styling, long cape sleeves, elaborate feathers and fringes, and of course, the delicate, feminine colours. Shades of salmon pink, mint, ivory and blue were used on soft, flowy fabrics like georgette, tulle, crepe and satin. All in all, it was a line full of sparkling details and old-world charm, ideal for a bride or bridesmaid who doesn’t want to stick to your typical red lehenga! Anushree Reddy’s New Bridal Collection With Nargis Fakhri Is Too Damn Gorg!